In 1778 the settlement of Cobleskill, New York consisted of twenty families living in farms spread out along Cobleskill Creek. As it was on the frontier with Iroquois territory, the settlers formed a local militia under Christian Brown. When attacks by the Iroquois were rumored to be coming in the spring of 1778, they appealed for additional defenses. A company of thirty to forty Continental Army regulars from Ichabod Alden's regiment at Cherry Valley under Captain William Patrick was sent to provide some protection. 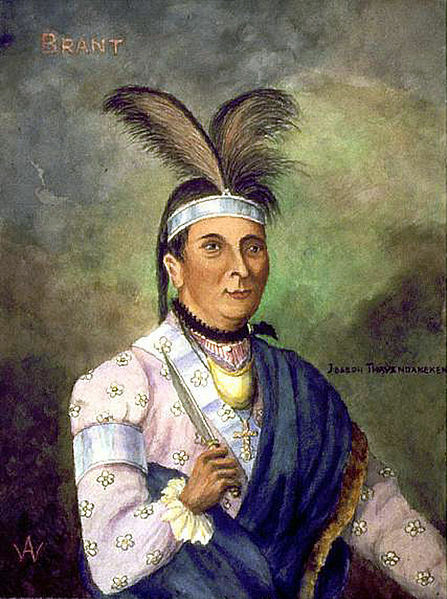 Joseph Brant and his band of more than 300 Iroquois and Loyalists had intended to attack Cherry Valley, but a ruse had made the garrison there seem large enough to dissuade Brant from attack there. He instead turned to Cobleskill, where he set up an ambush. He sent forward a small number of natives to show themselves to the defenders. When the latter gave chase, they retreated, drawing the defenders into the trap. In the ensuing surprise, Patrick and a number of Patriots were killed and most of the rest were scattered. Five men took refuge in George Warner's house, which Brant's men set on fire. Three of those perished in the flames, and the other two were killed when they tried to escape the fire. Brant and his men burned a total of twenty houses and outbuildings, nearly half of the settlement before moving on. On May 26, Captain Patrick and Lieut. Jonathan Maynard, Sgt. Jonas Belknap, a drummer, a fifer and 29 privates 34 men in all arrived at Captain Browns residence. Browns farm was located about 1 miles east of present village of Cobleskill, near the old Becker farm. By this time, fifteen men of the 15th Albany County militia were at Browns farm. Two days later, the Captain Patricks small force and Browns militia moved up the valley to the home of Lawrence Lawyer. Scouts were sent out to try to locate the enemy and on the 29th, three scouts encountered two Schoharie Indians and shot one dead. 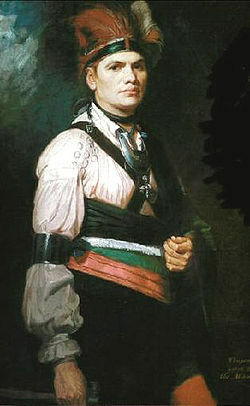 JOSEPH Brant, a loyalist Mohawk, captain in the British Indian department, and one of the most feared men on the frontier, had been expected to strike Cherry Valley. Instead, on May 30, his forces approached the settlement along the Cobus Kill, apparently looking for provisions and cattle. As Brants forces approached, Patrick marched his small force up the creek to the residence of George Warner, the most westerly house in the Cobus Kill settlement. It was located in the area known today as Warnerville. Patricks troops had been at Warners only a short time when about 20 Indians were discovered. Patrick pursued them although Captain Brown, by many accounts, feared the patriots were being led into an ambush. The enemy... had not been pursued a mile, before it was evident their numbers were increasing, wrote Simms. David Freemoyer, one of Browns militiamen, said later that the soldiers were in such hot pursuit of the Indians that they [the soldiers] were precipitated upon the main body of [Indians]... who were lying in ambush. The pursuit stopped and an engagement ensued with both parties fighting under the cover of the trees. Firing became intense. Patrick attempted to order a bayonet charge to break the Indian line but was shot before the charge could begin. Two of his soldiers were killed in an attempt to carry him from the field, several others fell in the battle and Brown took command. At some time during the battle, Lieutenant Maynard is said to have been spared by giving a Masonic sign to Brant. Whatever the reason, he was taken captive and remained a prisoner in Canada until late 1782. On hearing the firing of the enemy, families in the settlement sought safety in the forest or fled to Schoharie. Brown realized the Americans had been drawn into an ambush. Seeing that they were badly outnumbered, he ordered a retreat. Brants forces followed closely and the battle continued from tree to tree. The death of Capt. Patrick and his Lieutenant so damped the ardor of the Americans and the enemy was found to be so much superior in numbers being about 300 or 350, while that of the Americans was only about 200 [that] Capt. Brown ordered a retreat, wrote David Freemoyer in his pension application. The retreat became a rout and continued until what was left of Browns force was well beyond the settlement. They retreated with great precipitation to Fort Clinton, said Freemoyer. AS the soldiers streamed past Warners house, from which they had been drawn into an ambush, three of Patricks men and two of Browns militia took refuge inside. Their action cost them their lives but may have saved those who escaped. Being fired on from the house, the Indians halted to dislodge its inmates, by which the rest of the party gained time to make good their retreat. The house was set on fire, and three of its inmates were burned in its ruins, wrote Simms. Two continentals were killed while attempting to make their escape from the burning building. One is said to have been taken alive and tortured to death.